New Delhi was planned and built by the British, and boasts broad streets lined with trees. The city centres on two central promenades, the Rajpath and the Janpath. Janpath crosses it at the point where it reaches Raisina Hill, India's administrative centre. At the top of the hill is the grand Rashtrapati Bhavan, once known as Viceroy's House. There are many street vendors on Janpath who sell local crafts. Also found here are the interesting Tibetan Market, behind which is an enormous astrological instrument known as the Jantar Mantar. Another important attraction is the National Museum. 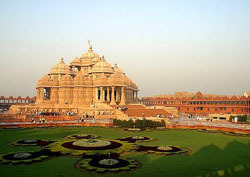 Important as the city is, New Delhi is actually just a small part of the Delhi metropolitan area. Connaught Place is in the very heart of New Delhi, easily spotted on maps as the big central circle, with eight roads radiating from it, including the major commercial avenue of Janpath. Its architecture is Georgian, modeled after the Royal Crescent in Bath. The buildings are organized around a central park. Connaught Place is a very popular shopping district. It has an underground shopping centre, the Palika Bazaar and many state handicraft stores. It also has both local and international eateries. A wealthy neighbourhood, Chanakya Puri was originally developed as a residential area for government officials and civil servants. Because of this it is well-equipped with parks and other open spaces, including Nehru Park. Nearly every home here faces a well-maintained park. In the southeast lies Chanakya Theatre. Chanakya Puri is home to most foreign embassies, some of which are architectural gems. Many embassy staff live here too, making it an international neighbourhood. An accompanying boon is that Chanakya Puri rarely experiences utility disruptions, and has safe drinking water. Parliament Street is a very prestigious street, also known by its Hindi name as Sansad Marg. It is important for its Indian Parliament House and police stations, but has other interesting sites. One is the well-known observatory, Jantar Mantar. There are also giant masonry instruments here. There are plenty of shops in this area, too. 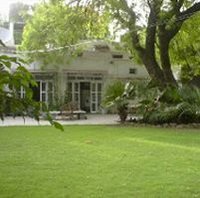 Jor Bagh is an old, quiet neighbourhood with over 200 hundred gracious homes along wide tree-lined streets, mostly fully-detached bungalows built in the late 1960s. Diplomats, professionals, expatriates and high-ranking executives live here. Currently, not too many houses are available here, but there are many apartments. Many new apartments are still being built here. This is a green area, with many well-maintained parks. Nearby are the refreshing Lodhi Gardens. There is a golf club, and the Delhi Gymkhana Club. The India International Centre is nearby. The Jor Bagh area is served by its own market. Jor Bagh is central, less than seven kilometres from Connaught Place. Near many bureaucratic areas, it is arguably the most desirable place to live in New Delhi. 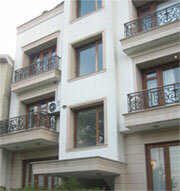 Golf Links is a quiet and fashionable area near the Delhi Golf Club. There are more than 200 houses in lots of various sizes in this stately area south of India Gate. Many overlook one of the well-maintained parks. Most houses date back to the late 1960s; some are large and elegant. A few have been renovated recently. More apartments are available than detached houses. Golf Links rarely has power failure and it has a reliable water supply. There is little air pollution here. There are many restaurants in this area. The convenient Khan Market is nearby. Prithviraj Road is a prestigious area at the heart of New Delhi that has for many years been home to India's VIPs, whose surnames are often plastered on their houses. It is green area, with many trees. Adding to the greenness are (to one side) Lodhi Gardens, and the Safdarjung Tomb on the other side - plus a golf course, and a race course. All the buildings are bungalows, building heights being restricted by the Delhi Urban Art Commission. Many government officials live here, as do the Spanish, Mexican, Venezuelan, and Turkish ambassadors. West End has 150 houses, and numerous parks. Just about every house has a park behind it. Many fashionable homes line West End's wide tree-lined roads. There is only one small and insufficient market, but many other markets nearby can provide everyday needs. This area experience power failures though, so a generator is a necessity. Anand Niketan, on the way to Delhi Airport, is popular among diplomats and expatriates, partly because the American and British schools are in nearby Chanakyapuri. There's housing in different price ranges, and of different types apartments, detached homes, luxury accommodation. There is a market, plus a few parks. It is not a very green or especially picturesque, and has power failures, so a generator will be needed. Its main attraction is really its convenient location. 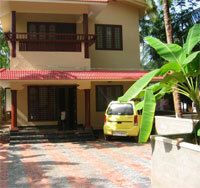 Shanti Niketan is a tranquil suburban area with mostly new houses. This area is popular for its central location; it is also an attractive area in itself. An elegant neighbourhood, Shanti Niketan's streets are wide and tree-lined. There are lots in various sizes and both houses and apartments. Shanti Niketan does have occasional power cuts, so a generator will be needed. A small market serves the area.